PuzzleMad: Eric Fuller! You are N times a genius! "Go Pit and Bill are the design genii, Eric is the master craftsman! Amazing collaboration that would have been almost impossible before the IPP and the Internet. 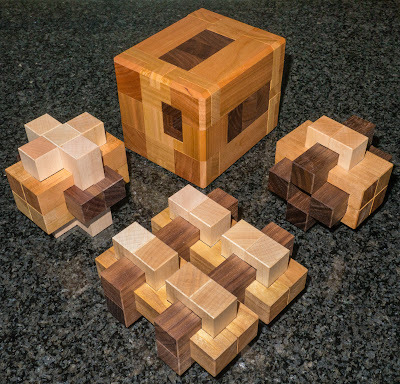 The puzzles are going to become even more elegant. We live on the golden age of mechanical puzzle world!" Thanks for reminding me of my foolishness! Where would we be without the designers? I maintain that Eric is also a genius but I mustn't forget who enabled his genius. Apology over! Can I put my flagellation device (whip) away now? Now those of you who are friends on Facebook will have seen that I have been making a very good attempt at bankrupting myself over the last few months! There just seems to have been a constant stream of absolutely fabulous puzzles coming out from all the puzzle designers and craftsmen. 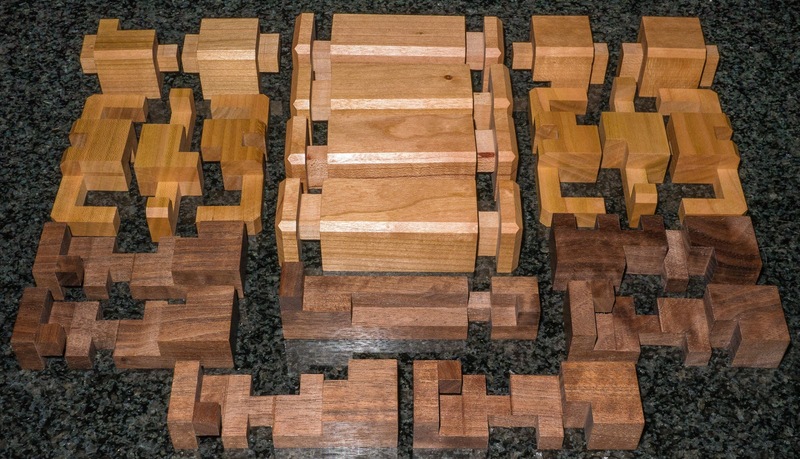 This is not just the wonderful wood workers but also the fantastic Chinese twisty puzzle makers who have made loads and loads of new twisties that are "absolutely essential" for my puzzling health! It doesn't stop there either - there's also the fantastic twisty modders and Shapeways designers also keeping me sane .....! Yeah! really! But despite all this, I have really been getting in to the N-ary group of puzzles and have been adding lots and lots of them to my collection. I established in my last blog post about them that there can never be too many of them in your collection and my aim would be to get a set as good as that of Dr Goetz Schwandtner. I am still a long way away from that but am certainly adding to my collection at an alarming rate - please don't anyone tell the present Mrs S how much they cost! No-one would even find my body! Eric Fuller, owner and master craftsman of Cubic Dissection produced the Tern Key in 2004 - it was designed by Goh Pit Khiam and requiring 134 moves of ternary coded movements it was a significant challenge and, whilst I am not a huge advocate of acrylic, these looked particularly lovely in clear and black and stainless steel fittings with the dimensions of the external rectangle being 29/18 = 1.61 which is very close to the Golden Ratio, I just lusted after it! Unfortunately, they were not available for love nor money - all 50 were sold and never seemed to come up again at auction. Luckily, thanks to the huge demand, Eric prevailed on him to allow a new release - another 30 copies were recently made and sold out in less than 24 hours. I was one of the lucky ones and it is a lovely little challenge which is a nice challenge in planning (although the stiffness of the locks did break my thumbnails!) - I apologise for the rubbish photos but these are really hard to photograph! In that same offering, and selling out just as fast Eric also had a brand new N-ary puzzle which I had not heard of before. See Derek - I am still just a Newbie at this! 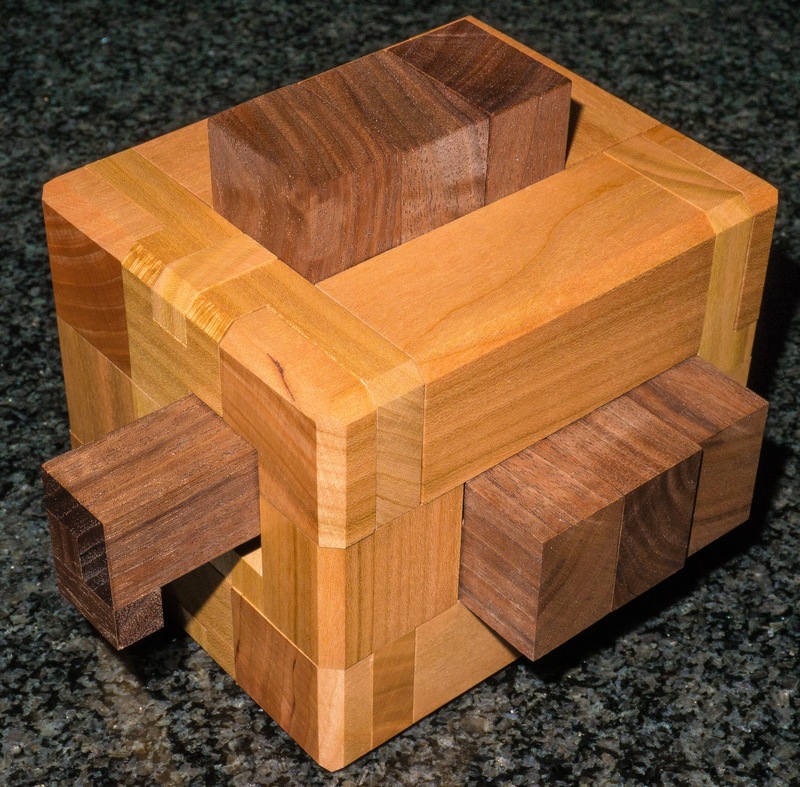 Bill Cutler's exchange puzzle for the 24th International puzzle party was called "Key", a 2 dimensional iteration of his famous Binary burr designed for him by Goh Pit Khiam. Eric convinced him to have another look at it and the result was Binary key II which was intended to improve the puzzling experience by increasing the number of moves required and also changing the design to make the moves smoother. 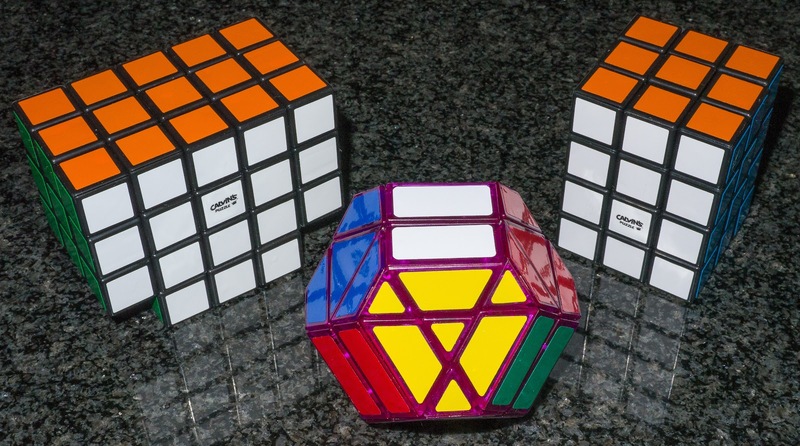 The solution takes 85 moves and is really quite fun to play with - all 40 copies sold out in a matter of hours! I was very lucky to be one of those people - and my wallet got lighter again!! Now at the end of my last N-ary post I lusted over another design by Goh Pit Khiam and made by Brian Young, the Ternary burr. I had borrowed a copy from a very trusting friend (Thank you so much Steve!) and even Mrs S said it was gorgeous. In fact Steve came very close to losing it! Only the promise by Eric that he would make some convinced me to relinquish it. I had seen a precursor to it on Bill Cutler's site. 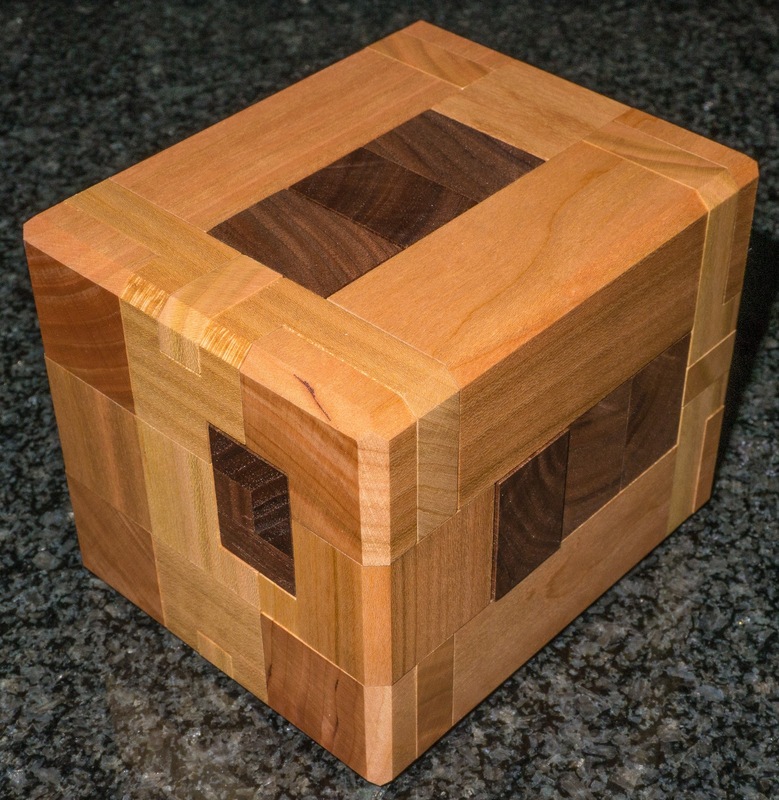 The Binary Burr was designed by Bill Cutler and it was awarded a First Prize at the 2003 IPP Puzzle Design Competition. Having asked Bill about obtaining a copy, I had more or less given up and forgotten about it until Eric announced that he would be making it again (with permission of course). "The Binary Burr is a burr that functions like a 6-ring version of the Chinese Rings. The puzzle consists of 21 pieces. One is equivalent to the ‘bar’ in a Chinese Rings puzzle, and six others are equivalent to the ‘rings’. 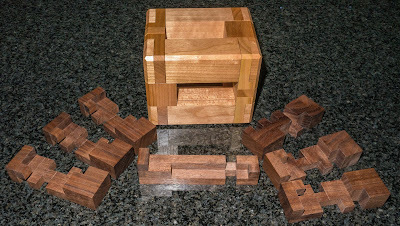 The other 14 pieces in the puzzle construct a ‘cage’ or ‘box’ that holds the other pieces in place. 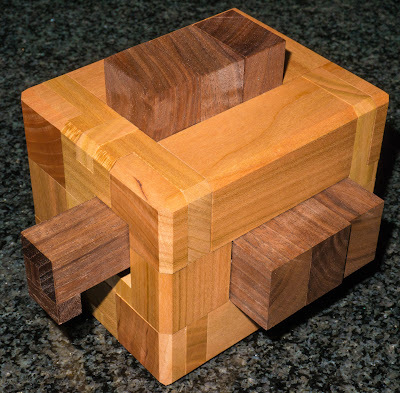 The entire puzzle should perhaps be called a ‘boxed burr’, and might be more logically constructed with only a solid wooden cage, however Bill chose to dissect this outer shell into smaller burr-like pieces.To disassemble the puzzle, the rings and bar must be manipulated until the bar is freed. After the bar is removed, then the rings can be removed one-at-a-time, and finally the remaining pieces come apart easily." Binary Burr - truly stunning! Eric claimed that he had trouble with the humidity in his workshop fluctuating a lot, so he increased the tolerances more than I usual to make sure the final product wouldn't bind up or get stuck. This meant that the puzzle turned out looser than he would have liked and so he sold it at a discount!!! He produced 39 for sale and lucky me managed to nab one! Frame with keys - look at all those notches! I was then able to completely disassemble the puzzle - there's a whole lot of beautifully cut pieces here - as yet I have not tried a reassembly - that will occur as soon as I have posted this review! Luckily I have a burrtools file to help me if required (but I don't think it will be needed). So all I have to say is "Thank you Eric, you are a genius N times over!" 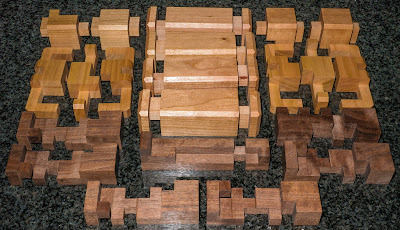 The other puzzles in my top picture are all beautiful and made from Maple, Walnut and Cherry and are some very unusual burrs. 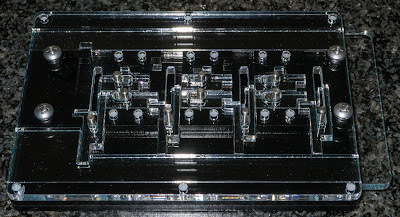 At the front is the Cold fusion, designed by Logan Kleinwaks and is a tougher more advanced follow-up to the Fusion puzzle that I discussed here. The workmanship is absolutely incredible on all of Eric's work and he has a few of these really interesting burrs still available including Fusion and Cold Fusion - they are so much more than a 6 piece burr. You really should have a look at them here - you really won't be disappointed. Go Pit and Bill are the design genii, Eric is the master craftsman! Amazing collaboration that would have been almost impossible before the IPP and the Internet. The puzzles are going to become even more elegant. 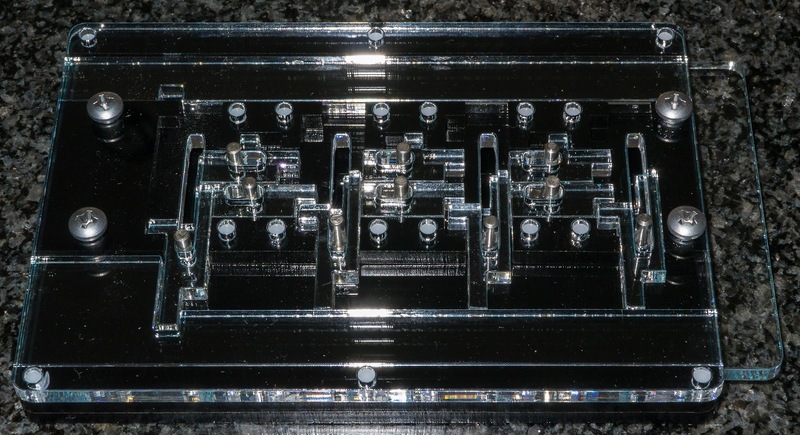 We live on the golden age of mechanical puzzle world! You are absolutely right. I always get blinded by the gorgeous wood and the phenomenal accuracy. I stand corrected and have whipped myself adequately both physically and in writing at the start of the article, which I have amended with an apology! I would like to thank for sharing such a great puzzle game information with us here. I must say that the puzzles are going to become even more elegant.